University of Arizona Press, 9780816516414, 270pp. Twenty years after the Viking missions of the ’70s, we are finally going back to Mars. No fewer than ten missions are planned for the period between 1996 and 2003, and it is likely that human explorers will follow soon after--perhaps by the middle of the twenty-first century. When they do, they will owe much to the Mars of romance, to the early pioneers whose discoveries and disappointments are brought to life in The Planet Mars: A History of Observation and Discovery. 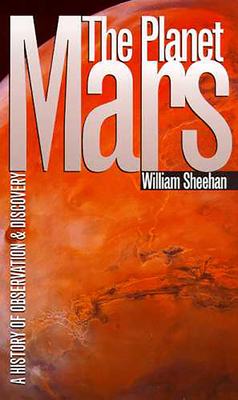 In this timely and vividly written account, William Sheehan traces human fascination with Mars back to the naked-eye observers of the planet. He recalls the early telescopic observers who first made out enigmatic markings and polar caps on its surface. Through lively historical anecdotes, he describes in detail the debate over the so-called canals of Mars, which encouraged speculation that the planet might be inhabited. Finally, Sheehan describes more recent theories about the planet, leading up to the present, when unmanned spacecraft have enabled us to make giant strides in exploration. Well documented and sparked with human interest, this book will be a useful companion and guide in interpreting the barrage of headlines about Mars that is sure to come over the next few years. Amateurs will appreciate the contributions that have been made to Martian studies by people like themselves, and professionals will find much original material that has never before been published. The American Mars Global Surveyor is scheduled for launch in November 1996, and soon after the American Mars Pathfinder will make its way toward the red planet. A Russian mission consisting of an orbiter and two landers will be launched in October 1997. These space travelers will write a whole new chapter in the dramatic story of Mars, a planet whose exploration has only just begun. Astronomy Book Club main selection and selections of Book-of-the-Month Club and Quality Paperback Book Club.